Lenin’s chief contribution to the Marxist canon was the development of Marx’s concept of the dictatorship of the proletariat. In the writings of Marx and Engels the concept of the dictatorship of the proletariat was most clearly elaborated with regard to the experience of the Paris Commune of 1871. Lenin used the phrase “the dictatorship of the proletariat” to describe a government representing the majority of the population, but prepared to use force to control the minority that opposed it. According to him, immediately after the revolutionary overthrow of capitalism there would be an intermediate period on the road to socialism. During that transitional stage, the dictatorship of the proletariat would perform the function of suppression of the exploiting classes. It would include the destruction of the very foundations on which the activity of exploiters was based, such as private property, and even the physical annihilation of the exploiters themselves. But the new government would be more democratic than any that had existed previously, as it would represent for the first time in history the interests of most Russians, rather than those of a privileged minority. 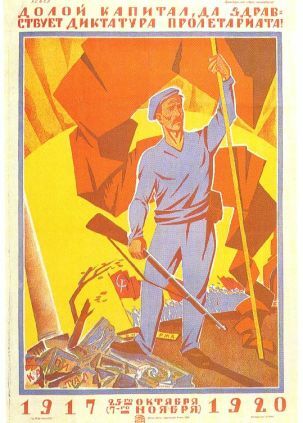 In Lenin’s view, the new proletarian government would need to build and maintain a coercive machinery of power and use it not just against its internal enemies, but also to repel “attempts on the part of the bourgeoisie of other countries to destroy the victorious proletarian socialist state.” Only with the triumph of the proletarian-socialist revolution on a worldwide scale would class struggle finally be over, society become classless, and the coercive apparatus of the state no longer be needed. The state would die out (or, to use Friedrich Engels’s famous phrase, simply “wither away”). The dictatorship of the proletariat would come to an end. If the Paris Commune of 1871 was the first attempt in history to establish a dictatorship of the proletariat, then Russia in 1917 became the first country in the world where the dictatorship of the proletariat triumphed and consolidated under the determined leadership of Lenin and the Bolsheviks.